they change. It is important to know how your body normally looks and feels. being able to recognise any changes. what is normal for you go to your GP without delay. You are not wasting anyone's time. Understand what's involved in having a breast x-ray (mammogram). We screen at various convenient places across Greater Manchester. 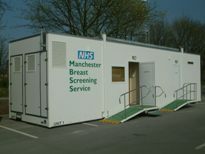 NHS Breast Screening Service. © 2009 Peel and Schriek Consulting Ltd.